Looks like busy week or so of planting coming up. Mind your back! I find this time of year manic, do you as well? I enjoyed seeing other Chionodoxa (mine are C forbesii) and these with deep blue are really beautiful! Lovely light pink Muscari too. Not sure I agree about Ribes foliage smell but I certainly agree about Muscari. Now, do I have the pink one? Can’t remember. Lots of colour and lovely plants in your post. The violets are especially beautiful. Wow that heuchera, carex and narcissi is a great combination! 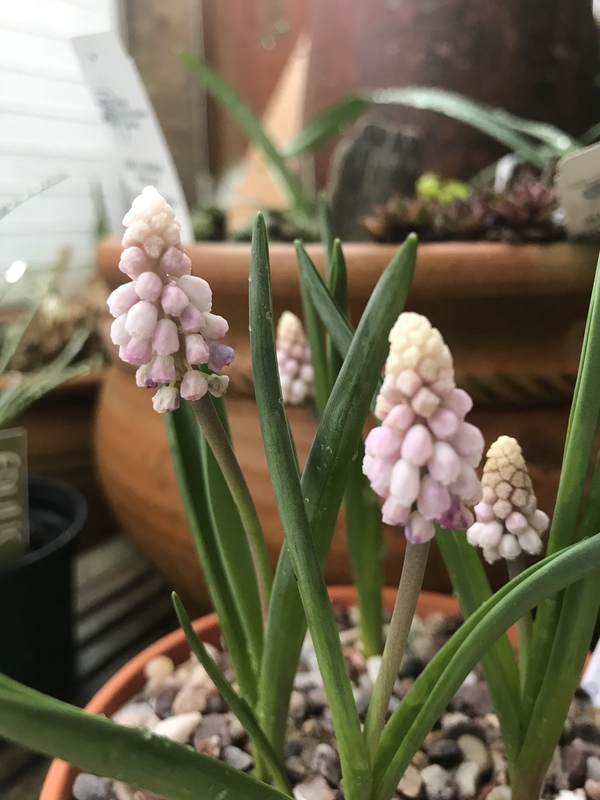 Love your little pink Muscari too – I always think of blue grape hyacinths but this is a sweet colour. ‘Pink Surprise’? hmmmm. I will stick with blue. Did you post a picture of a white one earlier? I like the blue because it is most familiar. (That is really what I like about grape hyacinth.) I might eventually like to get one of the whites that looks similar to the blue. I mean it would be nice if the foliage and floral structure matched, but only the color were different.